Hollington United Football Club’s first team pulled off a superb victory in a top two clash yesterday (Saturday). The Lions triumphed 2-1 away to previously unbeaten Cuckfield Rangers in the Mid Sussex Football League Premier Division. The result moved second-placed Hollington level on points with their table-topping opponents having played an extra game. Cuckfield, who had only previously dropped two points all season, started the brighter. Hollington struggled with the movement of the hosts’ front three and were guilty of giving the ball away too many times. Hollington goalkeeper Elliott Stokes was called upon more than once to deny the home side. On one occasion he got a superb hand to the ball as the Cuckfield centre-forward tried to round him. This seemed to wake the sleepy Lions and they grew into the game with Alan Foster going close. Hollington started to get on top and when Foster was sent clear by Jan Bailey, his square pass was met by Dommy Clarke, whose shot narrowly cleared the crossbar. Kian Moynes and Clarke again both went close, but the deadlock was finally broken when Foster went clear down the left and rounded the goalkeeper, who came a long way out. Foster then squared to Dan Kearley, who tapped in and continued his habit of scoring in big games. 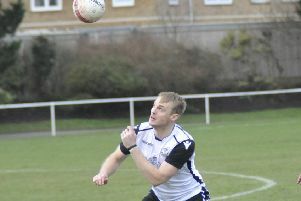 The Lions had a lapse of concentration at the back, which allowed the prolific Phil Gault through to equalise with four minutes left of the first half. Hollington had the ball in the net before half time when Clarke headed home after great work by Moynes, but the goal was ruled out for a push. The second half was a little tighter with both sides seemingly happy not to lose. The closest to a goal in the first two-thirds of the half was a superb effort from Allan McMinigal which crashed against Cuckfield’s post. Hollington introduced new signing Wayne Giles for his debut and 16-year-old Samuel Scott with the sole intention of winning the game. Cuckfield very nearly snatched the lead with five minutes left, but Stokes made a point blank save with his foot. Giles and Scott combined well, which resulted in a corner up the other end. Moynes floated it into Sean Ray territory and the experienced centre-back thumped home a header to seal three precious points for Hollington. A great game of football played at a very high pace by both sides. Man of the match, sponsored by The Duke (Silverhill) was Stokes. Hollington manager Scott Price said: “We came with a gameplan today and the main thing was not to lose. A draw wouldn’t have been the end of the world, but a defeat would have made it too big a gap in my opinion. “Again the trust in youth paid off. I could have easily have played safe with the experience, but they (the young players) just seem to rise to every question asked of them. “Games like this is why we know we made the right decision to move up. The game wouldn’t have looked out of place in the county premier division at times. “We started slowly today, but all in all the boys were fantastic. Elliott made two superb saves, the second actually won us the game. “If I had any criticism, we had a lot more chances than them, but Elliott was a lot busier than their ‘keeper. Hollington will host AFC Uckfield Town II in a Senior Charity Cup quarter-final next Saturday, kick-off 1.30pm. Mid Sussex League Premier Division top four (played-points): 1 Cuckfield Rangers 14-37 (+38 goal difference), 2 HOLLINGTON UNITED 15-37 (+20), 3 Lindfield 15-33 (+36), 4 Balcombe 13-30 (+36).